Krav Maga 2.25 Defensive Tactics "Crash Course"
Krav Maga is the official hand to hand / hand to weapon tactical system taught to Israeli military & law enforcement agencies. This course was designed for the person who wants a no non-sense approach to self defense but doesn't have years to spend training. 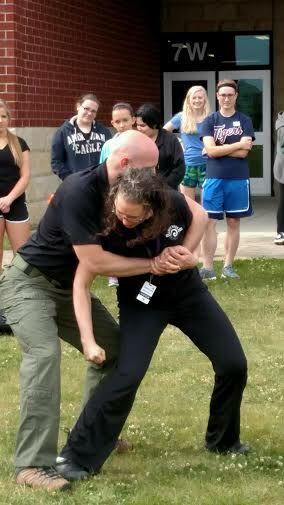 From special ops to soccer moms, novice to Krav enthusiast, this workshop is designed to give you what you need to help you survive potentially violent circumstances. Be a better protector! The seminar will address the physical, psychological, emotional, strategic and tactical methods on how to defend and escape both unarmed and armed attack scenarios. Krav Maga Combatives: How to Effectively Move, Parry, Strike & Control Your Attackers Space! The 6A's of Safety to Surviving Dangerous Situations. PCI's: Pre-Contact Indicators - Warning signs telling you when someone may become violent! You’ll learn simple concepts and techniques on how to better survive numerous dangerous situations. The seminar will cover progressive drills, strategies and tactics. This workshop will also discuss the effects of PTSD; the protector/defender mentality; and cross cultural conflict resolution concepts that are currently being embraced by our military regarding global operations overseas. *The seminar will be conducted in a non-competitive, supportive environment. It is open to all adults ages 16 and older. Civilian, law enforcement and military personnel are encouraged to attend. No experience necessary. All martial arts styles welcome.